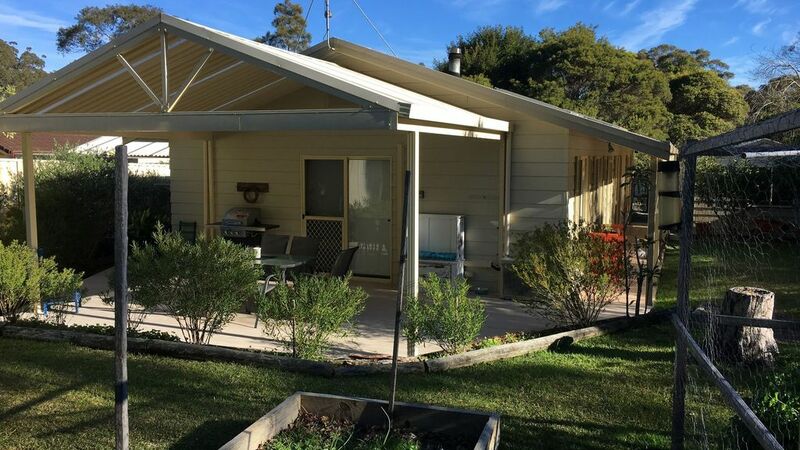 Shazza's Retreat is located 2 1/2 hours south of Sydney in the quiet of Sussex Inlet and surrounding suburbs of Swan Lake, Cudmirrah and Berrara. This part of the South Coast hosts amazing beaches, golf courses and beautiful National Parks where you can swim, surf, fish, ski, canoe 4WD, bush walk or just relax with a good book in the sun. My house is situated in a quiet street with fully fenced front and backyards where your 4 legged friend is welcome. It has 3 bedrooms with queen, double and king single beds and a sofa bed if needed. The quaint kitchen has all the basics needed, gas stove and oven, microwave, kettle, toaster, slow cooker, toasted sandwich maker and rice cooker. There is a selection of tea & coffee, including some basic cooking ingredients (oil, salt, pepper etc) if needed. The bathroom has a shower and a nice size bath tub for a relaxing bubble bath. Separate toilet and laundry. On cold days there is a fireplace in the main living area that heats the whole house with some wood provided. Also air conditioning for those hot days. The family room has a TV & DVD, with a lounge and a few comfy bean bags. The dining table seats 6, there is also an outdoor setting for 6 with a BBQ. I have a vegetable garden which your welcome to use if there is anything ready to eat. My lemon and lime trees (AKA, Corona and Gin n Tonic trees) are for your enjoyment too. DOGS ARE PERMITTED IN THE SECURE FRONT & BACK YARDS, ALSO IN THE LOUNGE ROOM, HOWEVER NOT IN THE BEDROOMS, THEY CAN BE IN THE HOUSE WHILE YOU ARE THERE, UNDER NO CIRCUMSTANCES ARE THEY TO BE LEFT INSIDE WHILE YOU ARE OUT. My house is STRICTLY a NON SMOKING environment. Minimum 2 night stay throughout the year and weekly during holiday periods. No linen is available and you can choose to clean the house before you go or let us do it for you for an additional fee. Take a 5min walk down the street to a quiet beach on Swan Lake or a 5min drive to the beach at Berrara. You are spoilt by choices with nature at your door step, you are surrounded by Conjola National Park, Swan Lake beaches at Berrara, Cudmirrah or jump in the car and head north to Hyams Beach, Jervis Bay and Huskisson or head south to beautiful Milton, Mollymook and Ulladulla. You will find many great places for coffee, restaurants, markets and great little shops where you'll find something special to take home with you. (There is a folder at the house where you'll find lots more information on what is available on the beautiful South Coast). Locally in Sussex you will find many Cafes, RSL & Bowling clubs, Cinema, boat hire, monthly markets and Golf course. If needed, supermarket, butcher, bakeries, bottle shops, medical & dental practice, veterinary surgeries, banks and ambulance station. It is handy to get the local newsletter :The Inletter" which comes out on Wednesdays and available in most local shops, this provides you with lots of information on what's happening in the area while you enjoy your stay here. I have a gate for the fire place if required for the safety of young children. Nice quite, bush location - a great getaway. Cosy layout with appropriate furnishings. Clean, tidy and secure with everything we needed. Many thanks, we will be letting our friends know about this little gem.. This retreat was exactly as shown in the photos - so clean, beautiful garden and surrounding porch, private and with lovely homely interior touches. Our puppy loved sniffing and exploring the grounds. Would stay here again.